Do you have a desire to travel the world, but think it just costs too much money? If you think it’s too expensive, and money is an issue for you, keep reading this blog post. Have you ever heard of an online service called SkySurf.travel (http://skysurf.travel)? What if I told you that you could visit 12 countries around the globe in 3 months for only $1,300 in airline tickets; possibly even lower?! I’m about to let you in on a little secret that not even the internet knows about yet. Why? Because SkySurf.travel is a brand-spanking-new website that was just recently launched. Now is the time to take advantage of this online service for booking cheap flights to destinations around the world. Here’s how it works: You simply visit SkySurf.travel and enter in your departure city and date. For this example, I’ll use New York City (NYC) as my departure city and September 1, 2016, as my departure date. You then select “Multi-city” and click on the “Search Best Deals!” button. First, I want to visit a country in Europe and I want to spend less than $300 for the flight. Browsing through my results, I don’t see any flights on that day that are lower than $300 to Europe. I am pretty flexible with dates, so I click on the “Find the best deals for September 2016” link. I have now found a flight to Oslo, Norway for $181 that departs on September 29! I add it to my BookIt list by clicking the “+ Add to BookIt List” button. The BookIt List is a list of itineraries that I’ve found on SkySurf.travel that I’m interested in booking later, kind of like a shopping cart or wish list, but for flight itineraries. 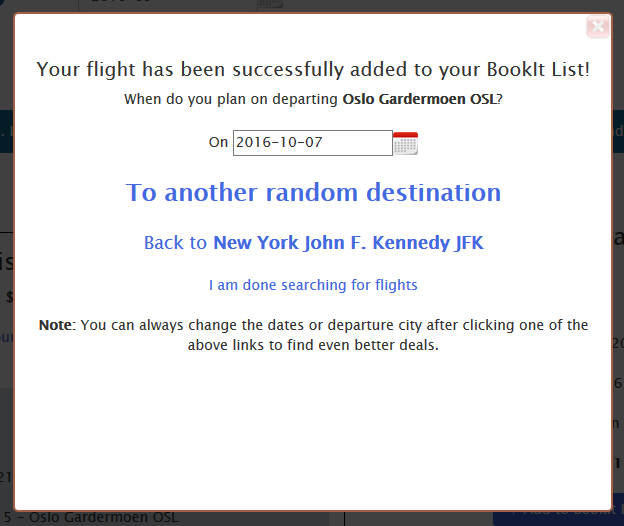 Once the itinerary gets added to my BookIt List, a pop-up appears asking me if I want to fly to another random destination or fly back to John F. Kennedy airport or if I’m done searching for flights. Since I want to visit 12 countries, I click on the “To another random destination” link, but first I’ll need to select my departure date from Oslo, Norway. I’ve selected October 7, 2016. Once I click the link, new results appear. My cheapest option is to Germany for $40! I add this to my BookIt List. No need to further explain how I get to travel the world to 12 countries for only $1,300, as you can see it in the screenshot above. I just repeat the process by adding a week to my prior flight’s arrival date, until I’m finished and want a return trip back home to New York City. There you have it! Twelve countries in three months for about $1,300! I’ll be home just in time for Christmas to tell my family and friends about my three-month adventure around the world! Of course, this is just the price for flights. How much you want to spend on lodging, transportation, food & entertainment, etc. is up to you. You can find cheap lodging at AirBNB, or if you are the adventurous type and have a small budget, you can CouchSurf at CouchSurfing.com or just travel with a tent. You can buy food at supermarkets or go out to restaurants every day. But if you’re looking for cheap; supermarkets, public transportation, and cheap-to-free lodging is the way to go. Check out SkySurf.travel and come up with your own cheap BookIt List. If you decide to book a trip on SkySurf.travel, send me links to your travel blog, photos, videos, etc. so that I can post them in my future blog entries. The world is your oyster!